So week 2 of #ClearOutAndEat was another success. We had a bit of a crap day on Saturday which resulted in the adults having a frozen pizza at 9 that night! No waste though as we had the dinner planned for Saturday on Sunday instead and I've added the roast pork to this weeks menu. The pepperoni and mozzarella stuffed chicken on Sunday went down a treat, it was delicious. I also added some homemade spicy tomato sauce to it which gave it a nice kick. That was new dish and happy it turned out so well. The curry on Monday was a bit too spicy for me but the boys devoured it. I'm surprised the boy child did seeing as it was extra spicy but he's becoming more like his Dad on the food front. The chicken and chorizo pasta was well received except for the chorizo left on the side by the boy child which I ate because I'd eat all the chorizo, I love it! We ran out of bread and milk on Wednesday so had to get a top up before the big shop on Thursday, again these are items that we would never run out of usually but I really think it's down to making a conscious effort to use what's already in the house so more bringing sandwiches to work or college instead of buying them each day, trying to get through the various packets of cereal in the kitchen for breakfasts instead of maybe grabbing something in the shop on the way to work / college and just trying to come up with different versions of meals and snacks using what's there. We still have a mountain of crackers of different varieties to get through so we'll probably make a dent in them this week. I've also found restricting choice for the boy child helps. 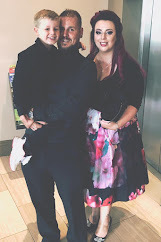 I'm all for letting him have his own mind and all that but when it comes to food he was getting too much say in his meals and we were wasting a lot. He's responded quite well to a more strict approach to food and his eating habits have really improved and he's been pretty much clearing his dinner plate this week. We baked some lemon and white choc chip cupcakes as our treat this week. I have a cupboard full for baking ingredients so really need to start using them up. 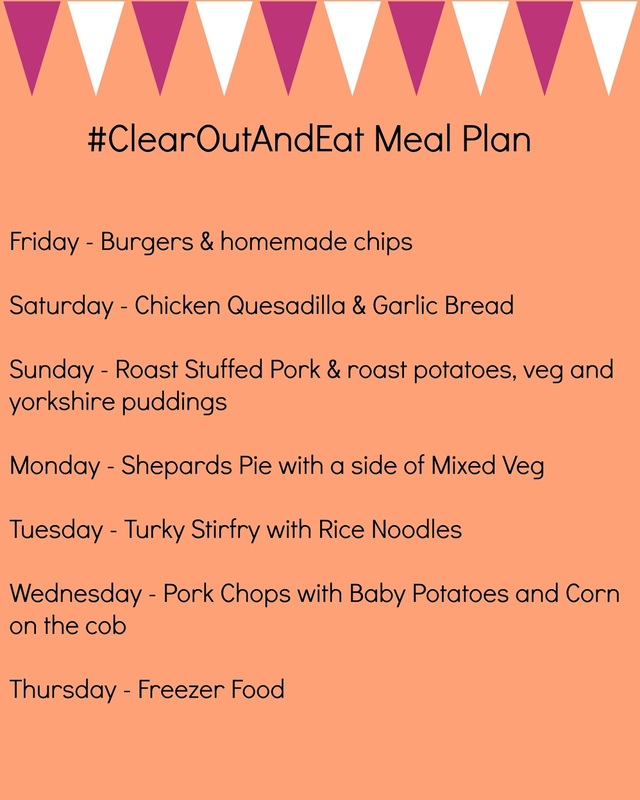 As we enter into Week 3 of #ClearOutAndEat I can already see so much more space in the cupboards and freezer and we haven't had any food waste in the last 2 weeks. Next week is bit all over the place because I'm not sure of the OH's hours at work and that plays a big factor in meals because he does the cooking on nights he's at home before me so I've managed to put together meals that are quick and easy or can be prepared the night before. Homemade chips are a staple in our house mainly because for ages it was the only form of potato the boy child would eat. I just slice up a potato, sometimes with the skin other times without and shake them up in a bag with a bit of olive oil and different spices. Paprika and chilli is a popular combination here. They are then cooked in the halogen oven so they crisp up quite well. The Shepards Pie will probably be prepared the night before and we'll just add the veg once we're home. We were under budget this week at €38.10. I got a deal on 2 packets of beef mince for €5.00 too so that'll cover 2 dinners which will more than likely have leftovers for a lunch or 2. A pretty easy menu this week and again a majority of those ingredients are already in the house. Have you got a meal plan for the week? I'd love for you to share. I am absolutely thrilled with how well you are doing with #ClearOutAndEat. Are you on Instagram? Tag your meal photos with #ClearOutAndEat and I'll include you in my next roundup on my bllog.